ELECTRIC TRACTION & MANUFACTURING CO. This order for bodies only. ET&M planned to fabricate trucks, all on contract from Brill. (Poss. Brill early type, 1 to 7.) Cars seated 13 ea. side, could run 96 miles between charges. Car 3 tested 8/8/90 (TD). No P.
Identical to order 2954, 35 contemplated but poss. only 20 built. All used on Coliseum (“Snake”) Line. Revenue service began Aug. 1890, shut down Apr. 1891. Not a single day were the battery cars able to run the line without the mule cars assisting! Cars stored in old Jefferson City RR barn with retired mule cars. Barn fire 9/30/95 (DP 10/1/95 p. 8) claimed 100 mule cars & 16 battery cars burned. Barn located on square Magazine-Octavia-Constance-Peters Ave., also called “old Magazine Street Car Line” barn. Lucky were battery cars moved to Arabella for RB, “cars to be spliced, two into one new car” (DP 8/19/94) before fire. Five definitely RB, poss. few more. RB cars poss. 22' OB and were only ones using Brill style peaked arch (Tudor design) sash (see inset). No P except a portion of such a car in an 1897 Mardi Gras parade (SRJ). 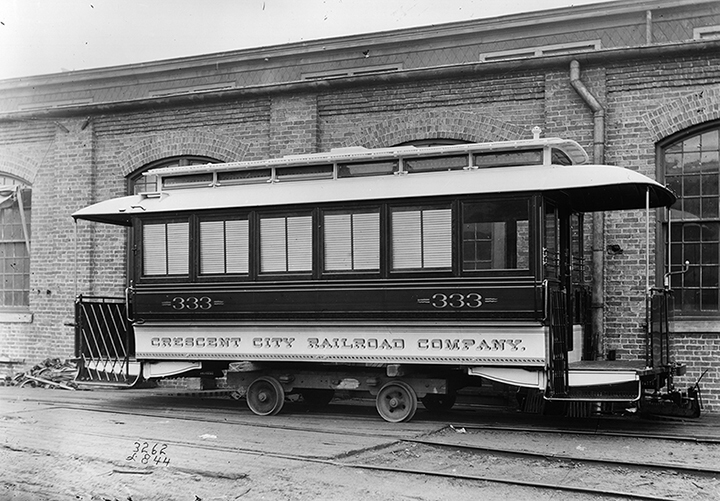 Cars numbered in low 300s, ahead of “Annunciation” cars (Pullman) — see below. These were called “Annunciation” cars — intended for service on that line. Had GE 800 motor and mechanical ventilator, P - N, S p. 114. LGT seats. LGT seats, other details S p. 111, P - S p. 109 & N. Truck order: Brill ON 4400, 10 No. 13 S. L. wrought iron frame, 36" WH 5/24/92 T-H WP 30 hp. motors begin shipment 7/20. P - S p. 121. RB 1895, closed platforms, conv. to private car “President”. Truck order Brill ON 6049 2 - type 22 27 Oct. 94. P - interior S p. 120. Another truck order: Brill ON 6437 Apr. 1895 4 - 33" WH “like 6049”. Yet another ON 6438 4 - 20" WH “like 6049”. Interior P - S p. 120 appeared in SRJ Oct. 1894 p. 40. Six of the 1892 + 1893 orders SLD — 4 to Home Elec. Co., Baton Rouge (Vol. 1, p. 33 & 36) and 2 to Brockton & Plymouth St. Ry. (Mass.) S p. 111. Poss. 4 SLD to Biloxi, Miss. Street Railway. P - N (Amer. Car Co. builders P). Poss. RT to ST ca. 1898-00. Came w/TV seats, poss. first elec. cars so equipped, 16 seats. RB — spliced into trailers ca. 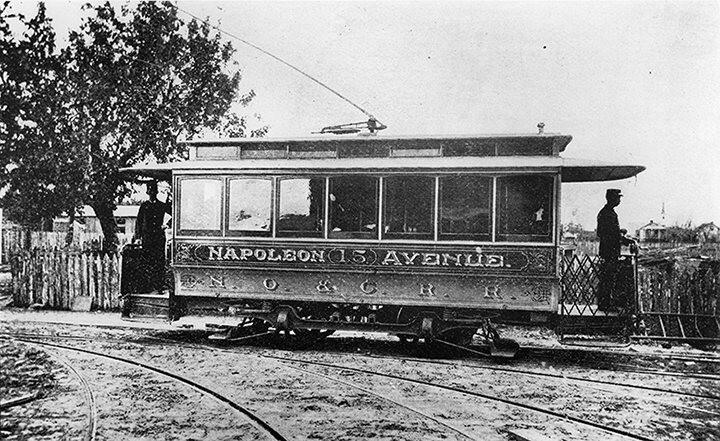 1903 at Canal Sta., N. O. Rys. See: Trailers, page cc (splicing work by ex-NO&C RR MM Frank Rojo). SRJ reported Apr. 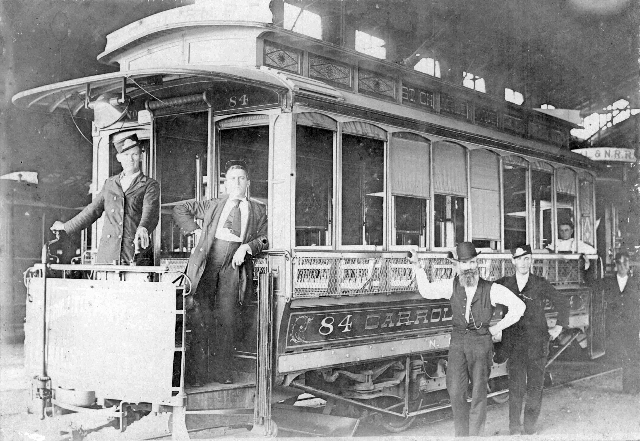 1895, NO&C operating 78 cars. Similar in construction to 71-82, except these were wiresides. TP 3/23/95 p. 7 — no steps on side, aisle with wicker seats TV. RB — spliced into DT trailers by Mr. Rojo at Canal Sta. ca. 1903. See: Trailers, page cc. 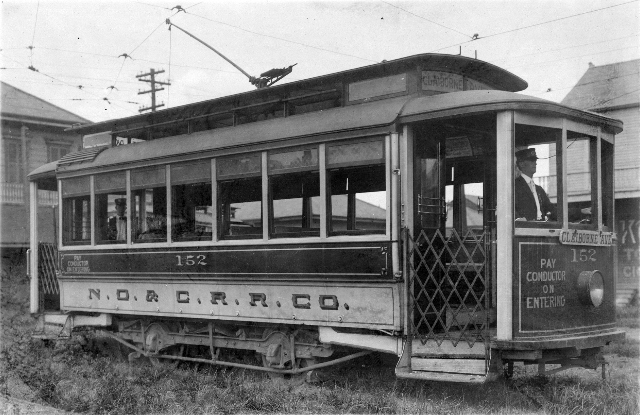 NO&C operating 90 cars in 1897. In 1899, NO&C planned BLD 15 “summer cars”, but no car higher than no. 95 reported in press until after the Ford, Bacon & Davis types arrived. Acquired 1899, merger with Canal & Claiborne RR. These are the first of the famous Ford, Bacon & Davis design. In 1900, NO&C listed operating 130 cars. See Canal & Claiborne listing for more FB&D details. Text copyright © 2008, 2009 Louis C. Hennick. Pictures copyright © 2009, 2015 by the persons credited. Picture captions copyright © 2009, 2015 Louis C. Hennick and H. George Friedman, Jr. All rights reserved.